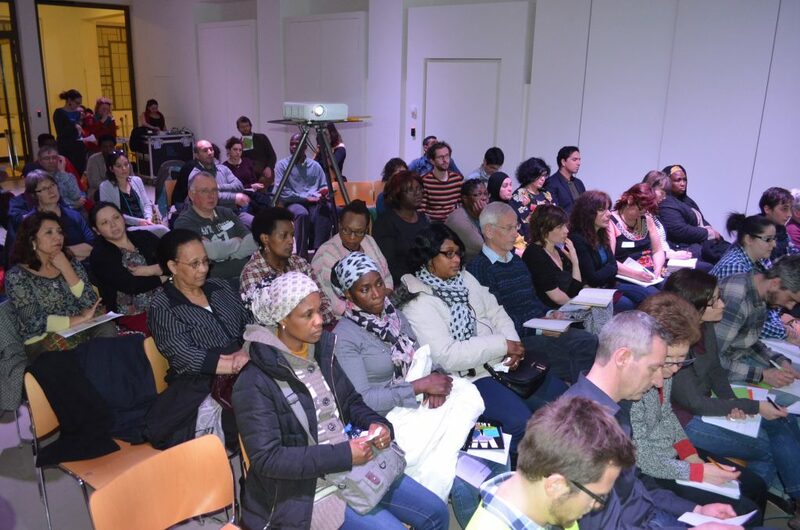 The Community Land Trust Bruxelles was created in 2012 as an initiative of residents, activists and neighbourhood organisations. 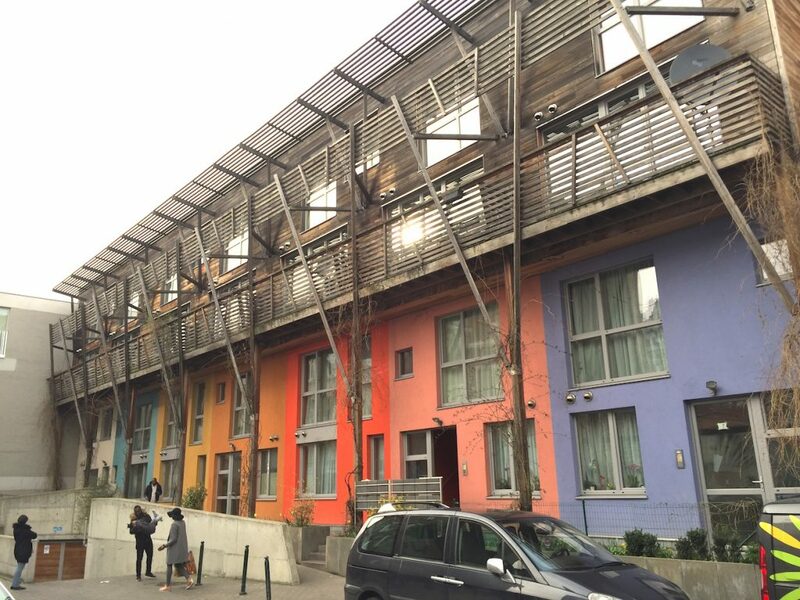 The CLT was founded as a reaction to the emerging housing crisis of Brussels, addressing the insufficiency of public tools to create social housing. With 9 homes finished and many more in the plans, the Community Land Trust created an instrument to help low-income families access home-ownership. In the same time, through retaining the ownership of land and using a governance structure involving future residents and organisations present in its neighbourhoods, the CLT excludes the possibility of speculation and individual financial benefits from rising housing prices. 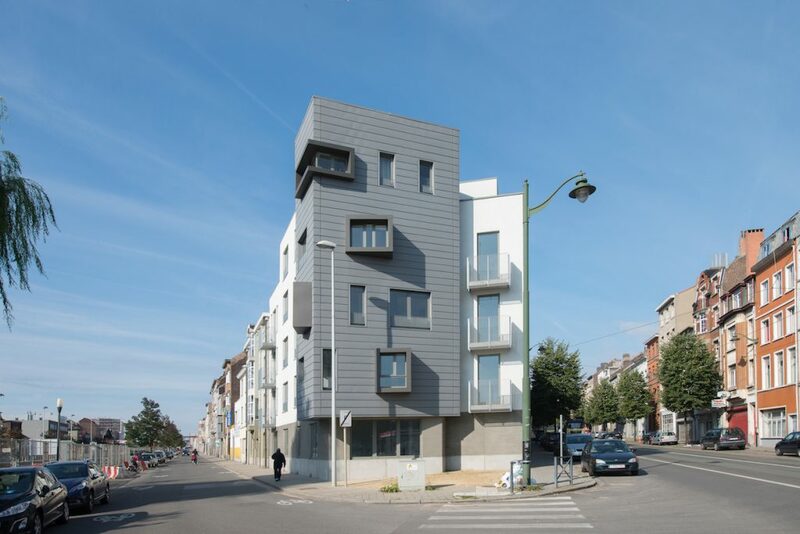 What is the context in which the CLT Bruxelles was created? In Brussels we have less social housing compared to other European cities. 12% of the housing is social and they are owned by 30 different housing associations (now they are merging) who for the last 20-40 years have not built any homes. Until recently, they were not experienced in this, they were not organised for it and there was a lot of opposition from the neighbours wherever there were plans for social housing. Therefore, although there was a political majority to invest in social housing and they reserved a large budget to do, it took years before the first new homes were produced. For us this was an opportunity to come with another format and some of the people who were involved with the community land trust already had experience with the social housing project L’Espoir. How did you build on the experience of L’Espoir? It is a very interesting project, although not on the legal or philosophical base because it is a very normal condominium: people who live there, they own their home and a part of the land. But it was very new that the future residents – poor migrant families – strongly participated in the project; we had a lot of positive attention with that and it helped us to prove that we were able to create well-functioning social housing projects. When we started seeing that the social housing format we used there might be something that could work and could be redone, we also discovered that we needed public subsidies for it. For L’Espoir we had to find the subsidies along the way and we were lucky to find them. But we wanted to do it differently: especially when you work with low-income families, you do not want to expose them to that kind of risk, so we have to assure funding from the beginning. We also started wondering that if we ask for all that money, it means a lot of money to make affordable housing for low income families: 30-40-50% of the budget has to be subsidised, otherwise it is not possible. We had to find something better than just giving a grant. There was also another problem. When one of these families leave the house, they can have all the value or the appreciation of their home. For some people it is strange to try to give ownership to really poor families but there is a strong culture of home ownership in Brussels and a housing policy that is historically based on helping people becoming owners. We have lot of instruments such as grants or social loans or tax credits. In the 1970s and 1980s, lots of migrant families bought homes in neighbourhoods like Molenbeek or Schaerbeek with these loans, and they refurbished them little by little. All of these instruments are given to the home owners and when the home owners sell their subsidised home, the selling price also includes the appreciation of the home, which is not sustainable and not just. It worked for many years but once housing prices started to rise, there was no money left to help families in need and there was suddenly no stock of social housing. We were looking for a solution that could combine the advantages that offer homeownership for the owners (security, independence, the possibility to build capital) with the advantages of a policy based on building public housing (creation of a stock of permanently affordable housing for low income groups). Why did you choose the format of CLT? 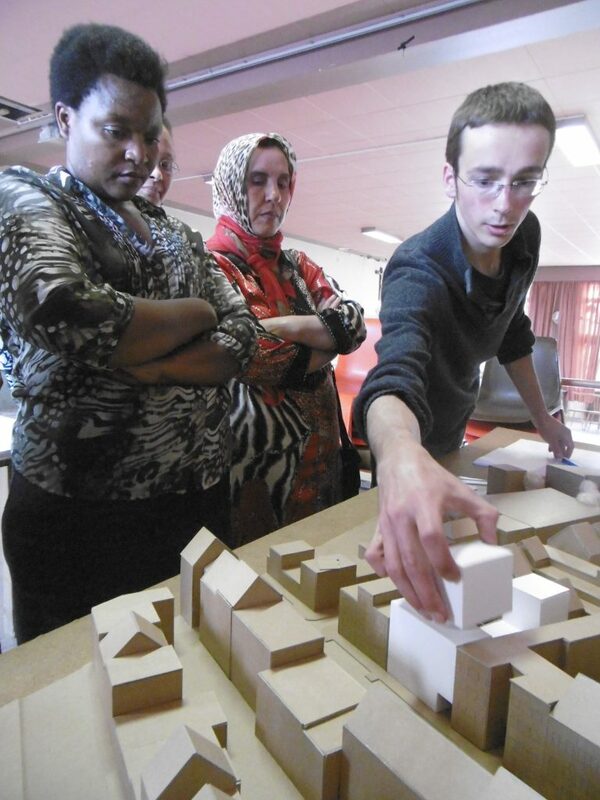 When we investigated, we saw that we could use cooperatives to create affordable housing, but in Belgium the statue of cooperatives, for different reasons, is not adapted to these kind of projects, so we were looking for alternatives. We heard about community land trusts in America, which was at the time a model not known at all in Belgium or in Europe. We heard about CLTs because the Champlain Housing Trust in Burlington received the World Habitat Award from the United Nations. We won a grant to visit the Champlain Housing Trust and the visit was very fruitful: they did not only have a solution for long-term affordability, but also had a governance system in place and interesting ways to integrate other functions than housing into their projects. The Trust had a lot of interesting elements that we loved. And as the Champlain Housing Trust was the first urban CLT in the USA that was supported by the authorities, we also met Bernie Sanders, who, as Mayor of Burlington in the 1980’s, made the creation of this CLT possible – it was a really inspiring visit. Do CLTs in general receive public support? In the UK, for instance, there are CLTs that operate without the involvement of public authorities, while other work with them. At the end of last year, for instance, the UK state provided a funding of £60 million to help CLTs and other community-led housing initiatives so there is some support by the authorities. We were also established with public help: in 2012 we were recognised by the regional government in Brussels in charge of housing and who also gave us the first grant to start our first project. And since then each year we receive regional subsidies to pay our team and to buy land. 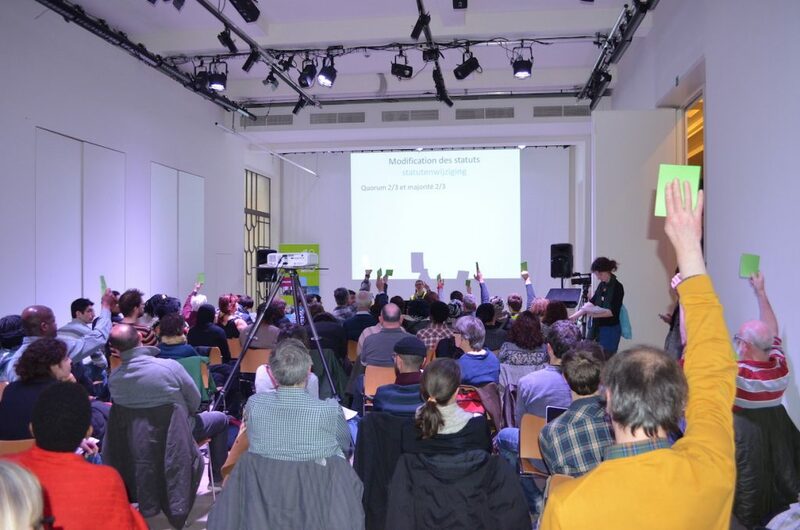 Public support, however, is not without questions: although there is a general appreciation of our participatory aspects and anti-speculative mechanisms within the public sector, there is also an ongoing discussion about how we should operate, if the CLT should own land or land should go to a public institution. For us, this is a very important issue. A CLT that does not own the land just would not work. If we manage to involve low income families in everything we do is also because we are the owners of the land and, as member of our board, they become co-responsible for the stewardship of that land. How is the CLT organised? The CLT owns the land, the homes on the land are privately owned by their occupants and we use long term lease contracts to make this possible. But ownership in this case does not include the possibility to speculate with the property. The resale formula follows the typical CLT format: we appraise the home the moment people enter and when they sell it, we calculate the difference between the two, they can have 25% of the appreciation and the rest is taken from the resale price, so the new buyers pay the initial price without subsidies plus 25% of the appreciation, in case the market has gone up. To ensure this, you have to find a way to legally separate land ownership from home ownership and in Belgium we have these rights since Napoleon, called the “droit de superficie” and “bail emphytéotique” that respectively allow for 50-year and 99-year lease formulas. We have to use it creatively to make it work for us: this legal system is not perfect for us and I think the legal will be more suitable one day, but by now, we have been working with these rights. The Brussels CLT has a complex legal structure. We have a foundation that owns the land but a foundation cannot be democratically governed, although this is an important aspect for us. Therefore besides the foundation, we have an association in charge of all daily decisions and the two are strongly linked by the board members: it is one organisation with two legal bodies. We receive subsidies from the region that help us buy the land. Then a part of the construction is paid with public money. Who has access to CLT apartments? First of all, to buy a home in the CLT you have to be eligible for social housing. This includes more than half of the Brussels population: although Brussels is a rich city, a large part of its population is poor. But within these margins there is a lot of difference. Those who are the poorest, who have the minimum income earn half of what those who meet the right to social housing. Therefore we had to find a pricing policy that makes it possible to serve all of these people: we set different prices according to income categories. The poorest group pays less than those who earn a little bit more for the same type of apartment. As we work with public money we had to find a system that was very transparent and objective. In our approach we really focus a lot on the community within the building. In Brussels we do not build single family homes, it is always apartment buildings. Whenever we buy a parcel of land, we make a program, we see how many and what types of homes we can build, then we launch a call. Those who are interested can apply and the first family on the waiting list that fits the criteria will become member of the group. Once we have the plans and we know what kind of homes we will build, members of the group will decide between them who will get which home. The group is not composed by affinity, but by objective criteria. And for us to make this work, for home owners with little income, mostly with less education, it is very important is to work on the community, not just putting the families in the apartment, otherwise it would not work. This means that we decide whom to sell to long before the homes are built. We organise groups of future home owners for specific sites, the moment we buy the land. The planning procedure takes a lot of time in Brussels, it takes one year, sometimes up to two years, between having the plans ready to getting the permit. You have to organise the tender, then you have to build, so it is at least 4-5 years between buying the land and when the homes are built. This means that there is already a selection criteria, people have to be ready to follow this process, not just to enter the group but to be active. Once a group is formed, it has monthly or two monthly meetings, and its members really become part of the process. Not everyone is willing to enter this kind of procedure. While in Brussels today there are more than 29,000 families waiting for a social home, we have 300 families on our waiting list. What do people on the waiting list have to do during these years? Our waiting list is composed by our members and it is not just a formality. For us it is important because our members are invited to our general assembly and can get elected to our board, we can provide trainings for them. They start saving money (a symbolical sum of 10€ a month). Recently, we also started to organise other activities with our members: gardening on the building sites the years before the construction, a bike rental program, a monthly festival. 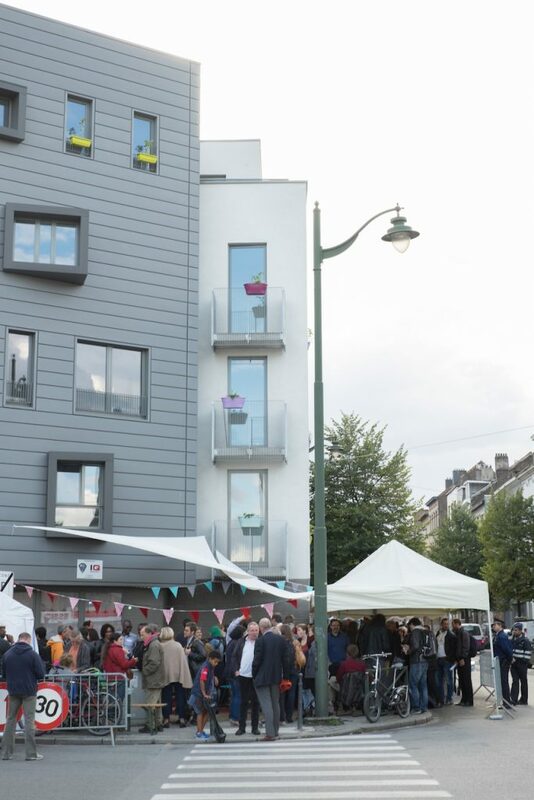 How does the CLT work together with a neighbourhood where it develops new homes? I think the way our CLT is governed it is a very interesting model to use at the neighbourhood scale. It is important to have different levels of decision-making and participation, bringing together the entity that owns the land and ideally also governs the neighbourhood with others: home owners’ organisations, cooperatives or tenants, organisations that are in charge of managing their homes, committees in charge of the public space, etc. One of the positive experience from CLT is the idea of involving the neighbourhood and the residents in the board and the management of the organisation. It is not always easy but it really works. Sometimes in our board meetings we have unprecedented encounters: people who were never in this kind of organisation start speaking with government representatives for the first time. There is certainly a disequilibrium between a poor home owner and a well-educated Ministry officer but having a place where this discussion is possible is an important aspect of governing areas of the city. While in Brussels’ neighbourhood contracts citizens only have an advisory role, in our board they can decide about investment and sales, which gives them a much stronger role in this governance scheme. Can you diversify your model and combine housing with other uses? We do not only want to provide housing: we want to make the city in a non speculative way. But as of today, we only have nine homes plus a lot of land. Apart from these nine homes, we have 90 more in preparation where we have the money for the land and the agreement to buy it. The first project of nine homes was only residential, because we bought an existing building where there was nothing else but in other projects, we try to integrate other functions. Our biggest project in the plans, with 32 homes, will also include a women’s centre at the ground floor, and almost each new project will include other functions than housing. One of the difficulties for developing non-residential uses is connected to funding. The subsidies we get from the Ministry of Housing are for housing only, and it means that people who want to buy non-residential units in our projects have to accept the CLT conditions of not owning the land, not receiving the entire resale price, excluding significant financial benefits. We found an association to work with us on this, they believe in what we do and they prefer buying space in our projects to renting properties from private owners. We would like to develop economic spaces and studios for artists but we do not have the funding for this right now. We are currently thinking about adding a third legal body to the existing association and foundation, a cooperative that could work with private investors. We have gathered a group of people, universities and associations to work on this concept and we received funding for the next years. Brussels, Community , commons, community, community land trust, English, governance, housing, neighbourhood, ownership, social inclusion.